The hollow earth novel Interior World by Washington L. Tower in 1885 offers readers a full summary of what to expect with the rather substantial subtitle of ‘A romance illustrating a new hypothesis of terrestrial organization, with an appendix setting forth an original theory of gravitation.’ What makes this work unique among entries in the field are its non-fictional frame of a third-person narrative and a hollow earth devoid of inhabitants. The preface of Interior World is little more than 100 words outlining the two objectives of the text: to present the author’s own theory of gravitation as it relates to the structure of the world, and ‘To present a narrative entertaining to boys, yet free from any thing tending to awaken vicious or ignoble passions’. This is an interesting dichotomy of intentions, the presentation of a complex scientific theory in a tale meant to appeal to male juvenile tastes (without offending their moral sensibilities). Tower feels that this sort of literature in America is sadly lacking, and that it is his job to help fill this gap. That he is doing this while presenting an idea that he claims to have spent years researching is just a happy cohesion of theory and plot. In the beginning, it takes nearly fifty pages to get to the interior of the earth. First there is the introduction of the two adventurers, Belivast and Widmore, who move from the gold rush in the American north west to being attacked by Indians to having a boy, Lethe Wildwood, dropped into their care without explanation. While taking shelter deep in a cave, the men espy large pieces of gold in a deep crevasse, and in their attempts to reach it, fall in. This is not the traditional Symmes Hole entrance into the earth’s interior, but this is still a Symmesian cosmology. Within five pages of falling through the chasm in the cave and finding themselves one again on terra firma, Belivast declares that the only explanation is that ‘The earth must be a hollow sphere, and we have passed through the crust or shell, and are now on the interior surface’ (p. 67). This followed by an explanation of how they passed through the gravitational convergence of the interior and exterior, followed by an explanation of the mathematics of light angling into the interior in a Symmesian fashion. As with other works, the creatures of the interior world are not quite like those found above, and harken back to the ice age, with mammoths to be found wandering about, having ‘migrated’ from its former home in North America (pg. 104). In true American Manifest Destiny philosophy, the protagonists, are inspired by their present circumstances ‘with the spirit of enterprise, and they determined to incur the hazards, difficulties, and hardships of a migratory life, being supported with the belief that they were destined to accomplish a great work – a work of no less importance than that of opening communication between two worlds’ (pg. 74). 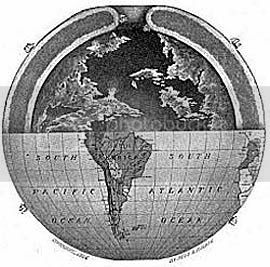 This is a sentiment found often in other hollow earth works; that of the characters feeling duty bound to alert the rest of the world to the presence of a hollow and habitable land waiting for trade, settlement, etc. The bait for readers to yearn for this world’s veracity is set in the rich open lands, exotic pelts to be obtained (pg. 85) and the gold that is just lying around waiting to be plucked from the ground (pg. 99). Interior World is not a lost race novel, unlike many of its contemporaries. Where every other novel is concerned with the exploration not just of new lands, but of new races, languages and cultural practices, Tower’s work is completely devoid of interaction with anyone beyond the three protagonists until the end of the novel. At first glance, it can seem lazy that the author has not engaged with building a lost race society, but this holds a greater significance for the new world dreamer: a wealthy land open to conquest (by Americans, of course) without anyone to object. That is one of the ultimate objectives seen in the majority of hollow earth narratives: the settlement of another ‘America’. As part of that American ideal, good living and religious morality are slipped into the text, when Belivast and Widmore suddenly feel that they have been neglecting their religion, and go on to reminisce about this for four pages. Their young charge, who apparently remembers nothing of his former life, is then instructed ‘to understand that Nature is the workmanship of a Divine Intelligence, and that we are indebted to that Supreme Intelligence for the wonderful mechanism of our organization’ (pg. 65). This language is certainly Tower reaching out to the boys he hopes are reading his book. At Lethe grows, he becomes the archetypal male hero, credited with being ‘devout and moral by nature, very conscientious, candid and truthful, his mind never having been poisoned by the examples of evil associates’ (pg. 109). This is another benefit of this unspoiled land: a place free of corrupting influences Tower perceives in contemporary America. The mythical view of the American pastoral as an Eden is being recreated in the hollow earth. In the tradition of formal colonial claiming, the three men recite the solemn oath ‘We… do by right of discovery, now formally take possession of the Interior World in the name, and for the eternal behoof of the United States of America’ (pg. 128). This kind of ceremony can be seen clear back to Symzonia. After years of journeying northward, they reach the north polar opening. The rough conditions of the arctic make their escape difficult, as demonstrated by the bones of a crew from a stranded whaling ship (surprisingly passing up on the opportunity to mention the Franklin expedition) found on the verge of the two worlds. Making use of the ship to effect their escape, this is when they find the first humans they’ve seen since entering the earth. This family uses the name Tichborne, playing on one of the great 19th century court cases, the lost Tichborne heir (in this fictional case, shipwrecked for years) and the imposter from Australia who went to England and convinced the aggrieved mother of Tichborne that he was indeed her son. Within two chapters, Tichborne’s daughters are married off to Lethe Wildwood and Rolin Widmore, finally bringing the ‘romance’ portion of the novel’s subtitle to fruition. These two new Adam and Eve couples decide to remain in their new land, while Belivast sails out, landing in Alaska. As happens in every other return-of-the-explorer narrative, Belivast’s tale is not believed, and so he keeps it quiet until enough years have passed, and publishes his life. In this case, though, since the story is presented in the third person, the last sentence reveals that Belivast will only allow this ‘history’ to be published as a ‘romance’ (pg. 172). That is not the end of the tome, though. A 33-page appendix follows, as the author feels the need to clarify the science he has used because ‘a decent respect for the opinions of the reader would seem to require that some proof in support of such novel philosophic declarations be presented’ (pg. 174). Tower goes on to cover such thrilling topics as Force, Negative Gravitation and the Solar System. What is even more unusual that an appendix in a work of fiction is the five-page index, assisting readers in referencing everything from ‘Discovering ferocious animals’ to ‘Quarters for the winter’ in case there was an especially thrilling part of the novel they wanted to go back to. At least, that is what one is left to suppose, because it makes little other sense in having an index for this work. Washington L. Tower. Interior World. (Oakland, OR: Milton H. Tower, 1885). P. 3. The men decide to be clever in naming their charge, ‘Lethe’ being one of the rivers of Hades that flow into the underworld and causes amnesia in those who drink its waters. ‘Wildwood’ is a surname to denote the situation in which he was found.